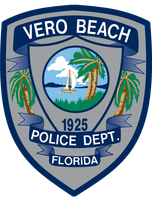 ​The Vero Beach Police Department is comprised of a group of dedicated men and women who strive to exceed the expectations of our fine community. Please take your time and learn about our professional agency and what we have to offer to our citizens and visitors alike. If you are a city resident or business owner please partner with us and join one of our neighborhood watch groups. Collectively we can make a difference! The City was originally incorporated in 1919 as the City of Vero. In 1925, the City of Vero was re-incorporated as the City of Vero Beach and was transferred from St. Lucie County to Indian River County. The City of Vero Beach consists of 13.1 square miles and is located about 190 miles south of Jacksonville and 135 miles north of Miami on Florida's east coast. The City's population is estimated at 18,000. We, the members of the Vero Beach Police Department, are committed to providing professional police service through a partnership with the community which promotes the highest quality of life and a sense of trust and safety for all residents, businesses and visitors. The Vero Beach Police Department has been accredited by the Commission for Florida Law Enforcement Accreditation (CFA) since February of 2002. The initial accreditation is valid for three years and we have completed the reaccreditation process in 2005, 2008, 2011 and 2014. We are scheduled for reaccreditation again in 2017.